The key changes pertaining to the desktop and mobile hard drive market in 2003 were related mostly with the Serial ATA interface, increased record density and reduced dimensions. Last year was a period of transition: all the new ideas applied to the new solutions in 2003 or their prototypes will be realized only next year. Just look at the Serial ATA interface. No sooner had such the hard drives got a steady position on the market and the chipset makers reported on implementation of the Serial ATA 1.0 than the developers released the Serial ATA II. The Serial ATA II: Extensions to Serial ATA 1.0 Specification, Revision 1.0 was ratified yet in October 2002; the first prototypes of the hard drives having this support were released at that time as well. In autumn, at IDF Fall 2003, this standard was extended with Serial ATA Digital 1.1, Port Multiplier 1.1 and Port Selector 1.0.
adds asynchronous notification from Digital 1.1 to eliminate the need in checking for installed or removed devices. enables two different host ports to connect to a single device to provide a backup data path Port Selector 1.0 is a compulsory structure component for RAID, NAS and backup system builders that develop fully reserved storage topologies. This year the Serial ATA II will get a full support in some devices. Last year we got first controllers and first samples of hard drives with the integrated NCQ support (Native Command Queuing) which expands functionality of devices and storage systems. As you know, with the Native Command Queuing the controller analyzes requests from from the processor and queues them in order to accelerate the process and minimize the search time. Besides, the Serial ATA II hard drive controllers must be able to make queues and execute them without processors. The mechanism of operation of the Serial ATA Native Command Queuing is similar to the SCSI queuing, but it supports up to 32 commands in contrast to the 256-level depth of SCSI. The NCQ hard drives were first delivered yet at the end of last year by Fujitsu: they were 2.5" hard drives with the Marvell 88i6535 chip supporting SATA II including Native Command Queuing, but the mass production of such solutions is still ahead. By the year-end almost all hard drive makers launched their Parallel ATA models with the size up to 250 GB, and the buffer up to 8 MB. The most popular were 7200 rpm solutions. The standard remains very popular and unwillingly yields its position to the new series interface. Last year we also got a lot of external drives with the USB 2.0 and FireWire interfaces from all market leaders under their own trade marks. If at the beginning of the year they were exotic, by 2004 the external hard drives formed their own class. On the top of it, there are models combined of two and more drives with the total size of 500 GB, a kind of a data bank for home use. Some Japanese companies offer such drives equipped with a wireless interface. In combination with other functions it results into a new class of home file servers. By the end of 2003 the market of hard drives and their components (heads, platters and engines) were divided between several large companies. 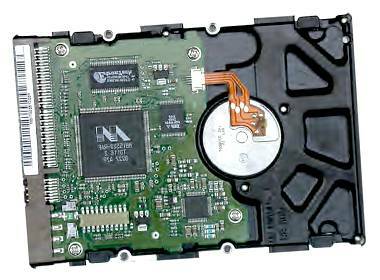 A hard drive is a very complicated electronic and mechanical device with high production requirements. The expenses for HDD development are higher, and it's quite difficult for new companies to get into this market. One of the noteworthy new-comers is GS Magicstor, a Chinese manufacturer of miniature hard drives and a direct competitor of Toshiba. 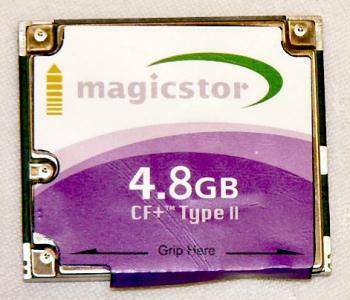 GS Magicstor was founded in August 2002, but the first factory was completed only in March 2003. By the end of Q1 the company delivered the first samples of its hard drives, started the mass production of its 2.2 GB and 2.4 GB lines - Magicstor 1022C and Magicstor 1024C respectively, and launched its flagship 1" Magicstor 1048c, 4.8 GB. 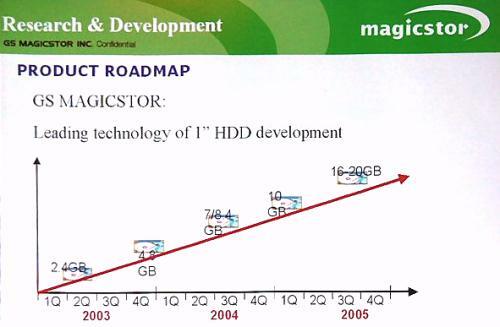 The further plans look really admirable: GS Magicstor intends to deliver 1" 7-8GB drives in the second half of 2004, 10 GB at the beginning of 2005 and 16-20GB drives by the end of 2005. In 2004 they are going to ship some 5 million 1" hard drives. Its branch establishment, GS Magicdrive, plans on starting mass production of 1.8" hard drives from March 2004 at the factory which has been under construction since July 2003. The drive sizes are to be 40, 30, 20 and 15 GB. GS Magicdrive's production plans are even more impressive: up to 2.66 million hard drives in 2004, up to 10 million HDD in 2005 and about 20 million in 2006. Toshiba is going to increase the monthly output of 1.8" drives twice up to 600,000 pcs. At the moment Toshiba is the largest manufacturer of 1.8" drives and it controls 98% of the world market. 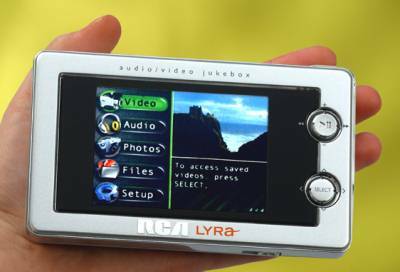 Its first model was a 2GB drive released yet in 2000. Currently, it ships 20, 30 and 40 GB solutions 5 to 8 mm high. Toshiba is going to increase orders for 1.8" drives placed with the Matsushita Kotobuki Electronics Industries. All hard drives produced by Matsushita Kotobuki Electronics will be sold under Toshiba's trade mark. The volumes of sales of hard drives keep on growing up, and the growth rate is increasing. Although the industry development in 2002 was quite slow, the sales exceeded 200 million hard drives. 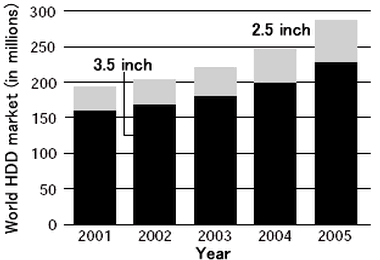 In 2003 the sales of 3.5" and 2.5" drives reached 220 million. The production rates keeps on increasing because of the growing consumption of home mass-production goods: navigation systems for cars, consumer DVD recorders, players etc. Although 2.5" drives are very popular today, the sales of 3.5" drives dominated - 81.3% (179 million pcs), and remaining 18.7% refers to 2.5" and smaller models (some 41 million pcs). But the analysts predict an inevitable transition to 2.5" because they are widely used in consumer devices and especially in notebooks which are already more popular than desktop solutions in some countries. Besides, such drives are also often integrated into low-power blade servers. One more rapidly developing sphere is standalone external hard drives for storing digital photos and transportation of multimedia content. Such drives usually have several flash card slots, USB and FireWire ports and sometimes a color LCD for data preview, and hardware audio/video players for handling such files. Although the supply of such external multimedia storage devices is growing up, they are not typical hard disc drives. However, the technology development often results in a combination of several solutions; as you know, it's not easy to tell the difference between pocket PCs with wireless interfaces and integrated phone and smartphones supporting PDA features. By the way, PDAs will soon get built-in hard drives because mass production of hard drives smaller than 1" is just around the corner. The hard drive manufacturers keep on merging or buying each other. In December 2002 Hitachi acquired IBM's HDD production and founded Hitachi Global Storage Technologies (Hitachi GST). 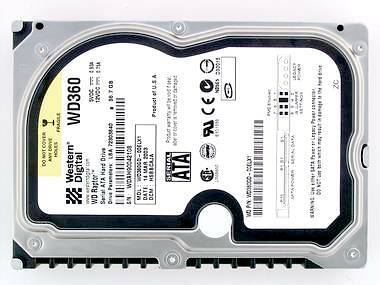 In July 2003 Western Digital absorbed manufacturers of magnetic heads, Read-Rite. In August 2003 Nidec, engine maker, announced purchasing Sankyo Seiki Manufacturing. One of the companies that recently appeared on the market and quickly climbed up the ladder is Samsung Electronics. 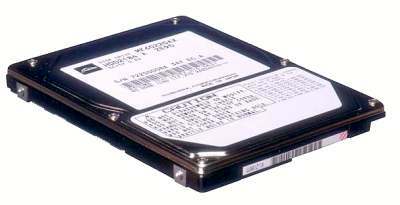 In April 2003 the company said that by 2005 Samsung is going to become a leader in hard drives sales. The head managers look very confident and are spectic about competitors' might. At the moment Samsung ships several lines of 3.5" drives, 7200 rpm, up to 80 GB per platter, Serial ATA and Ultra ATA/133 interfaces, 2 or 8 MB buffers, 20 to 160 GB. A distinguishing feature of all Samsung's hard drives is hydrodynamic bearings, NoiseGuard, SilentSeek and ImpactGuard technologies. Samsung's ATA drives get 1+2 years of guarantee, i.e. you can get money back only during the first year, but you the company will repair or replace the drive for free during three years. If Samsung drives have high quality and performance, this trade mark can soon win users' hearts like, for example, Quantum and Fujitsu who do not produce anymore hard drives for desktop PCs. 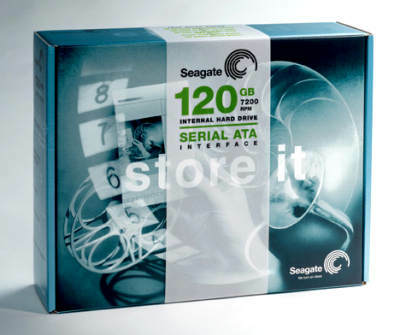 Seagate launched a traditional line of 3.5" drives and got over 1.5 million Serial ATA drives in December 2003. The company also initiated production of storage devices for tablet PCs and started selling its new Momentus drive for notebooks. One more curious Seagate's initiative was the intention to commence production of corporate hard drives of the 2.5" form-factor in 2004. 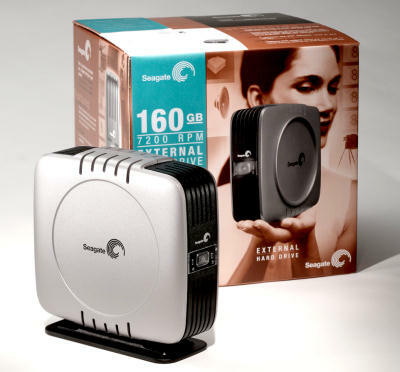 Besides, since autumn Seagate has been shipping its external hard drives (to USA only). Such drives have a separate copy button, a separate power switch that prevents accident power cutoff, hot-plug support, 7200 rom, 8MB buffer, SoftSonic engine with hydrodynamic bearings. The USB 2.0 and FireWire drives can be of 160 GB and 200 GB. The Seagate External Hard Drive will start shipping to other countries this year. 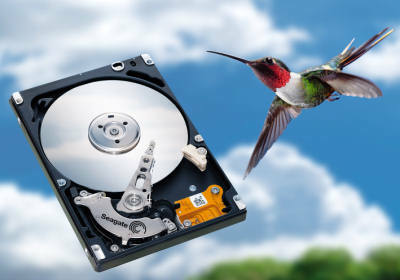 Western Digital's performance also was successful last year, especially thanks to its Raptor, the first desktop hard drive of Serial ATA interface and Enterprise Serial ATA (ESATA) class, with the rotational speed of 10,000 rpm. By the year-end the 36 GB WD Raptor WD360GD released in summer was supplemented with 74GB WD740GD. At the end of 2003 the hard drive makers released a lot of various drives with a high data density. The key promising features are the vertical data recording technology and development of new sensitive heads. As to the engines, ball bearings are more and more often replaced with fluid ones, and now they offer to use air instead of oil. Besides, some companies hope to develop drives rotating at the speed of 20 rpm and over in the near future. It seems that this year will be as interesting as last one in the sphere of hard disc drives. Although the number and quality of various types of drives is growing up (like flash cards), hard drives will remain key storage devices. Anyway, there are no reasonable ideas of replacing them for an acceptable sum of money.